received the organization’s Francis R. Dietz Award for Public Service. The Hospital Association of Rhode Island honored Sen. V. Susan Sosnowski (D-Dist. 37, South Kingstown, New Shoreham) and Rep. Teresa Tanzi (D-Dist. 34, South Kingstown, Narragansett) with the Francis R. Dietz Award for Public Service at the organization’s annual meeting Thursday morning. Both Senator Sosnowski and Representative Tanzi have been strong advocates for hospitals and health care in the General Assembly. Most recently they introduced legislation (2017-S 0577Aaa, 2017-H 5840A) that significantly reduces the regulatory burden experienced by physician practices that are acquired by hospitals. The bill allows physician practices to maintain their current license standards, even if a hospital system owns the practice. The legislation was signed into law by Gov. Gina Raimondo on July 19. 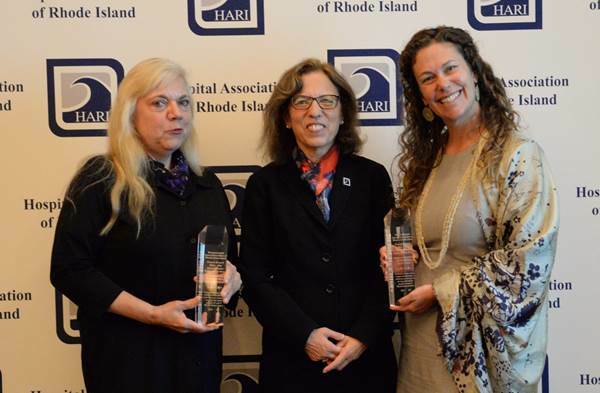 “I am honored to have been invited to accept this award, and particularly humbled because it is from the Hospital Association of Rhode Island,” said Senator Sosnowski. “I feel lucky to have worked with the Hospital Association of Rhode Island in addressing the health care needs of all Rhode Islanders,” said Representative Tanzi.